Jack was born Francois Henri LaLanne on Sept. 26, 1914, to French immigrants John and Jennie; when the average American male was expected to live to about 52. Jack was the second of three sons. John LaLanne, his father, appears to have died 58 years old of a heart attack. 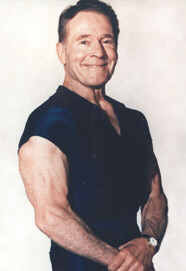 Jack LaLanne exemplifies the health benefits of diet and exercise. Jack LaLanne's transformation made possible by Paul Bragg at the age of 15 lay first and foremost in nutrition. But, after becoming a strict natural foods vegetarian, Jack realized he would not be completely healthy unless he was also fit. He joined the Berkeley YMCA. Swimming and wrestling were about the only organized exercise activity the YMCA offered in those days, so Jack LaLanne became very good at both. Jack eventually built his own backyard body building gym that he rented out to police and fireman. He attended a chiropractic college on the weekends. On Fitness: "It's a way of life." At 22 in 1936, Jack opened a gym called Jack LaLanne's Physical Culture Studio on the third floor of a building on 15th and Broadway, Oakland, California. Soon LaLanne was stressing the value of weight training exercise for athletes at a time when few did. He, also, encouraged women to join men in gyms and work with weights. Jack LaLanne did the same for children, older people and those with physical challenges. For over 30 years, Jack was on television promoting exercise. On television, he would lure, prod, encourage and exhort viewers to take responsibility for their health and fitness. Jack LaLanne's breadth of lifetime experiences included roles as a personal fitness trainer; nutrition consultant; author; and manufacturer, supplier and retailer of whole grain breads, cereals, bars, shakes, vitamins, supplements and all kinds of exercise equipment. "You can eat perfectly but if you don't exercise, you cannot get by. There are so many health food nuts out there that eat nothing but natural foods but they don't exercise and they look terrible. Then there are other people who exercise like a son-of-a-gun but eat a lot of junk. They look pretty good because the exercise is king. Nutrition is queen. Put them together and you've got a kingdom! Jack is most famous for a series of well-publicized feats of strength that always took place on his birthday to remind people that they could maintain fitness and health while growing older. "I wanted to show I wasn't just a muscle man. I was an athlete," Jack LaLanne said. "Later, I did it to show that getting older doesn't mean you can't be strong and healthy." Much of Jack's commonsense health advice sounds like a broken record playing over and over again, since it has never changed in over 50 years. He exercises each day for 2 hours from 6 to 8 o'clock in the morning. His workout consists of one hour of bodybuilding followed by one hour of swimming. Breakfast, for Jack, is a power drink with 50 grams of soy protein and soymilk, plus a whole-grain cereal, and between 40 and 50 nutritional supplements. Lunch consists of four egg whites, five servings of fresh fruit, and five raw vegetables. For dinner, Jack has 10 raw vegetables, a salad, soup, whole-wheat bread, 3 to 4 ounces of fish: Served always at a restaurant. While Jack often says: "If man makes it, don't eat it;" he definitely believes in drinking a high protein shake first thing in the morning in order to keep his blood sugar stable. In recognition of Jack's achievements, he was awarded a star on the Hollywood Walk of Fame. 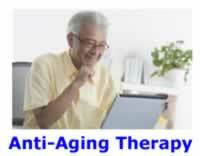 The above picture of Jack LaLanne in a very public event documents forever how Jack looked at 88 years of age on Thursday September 26, 2002. 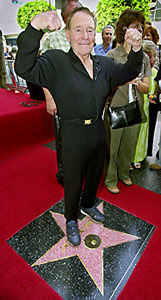 "I'm going to live to be 150 years old," Jack LaLanne told an audience on Hollywood Boulevard for the Walk of Fame ceremony. "Stick around and find out."